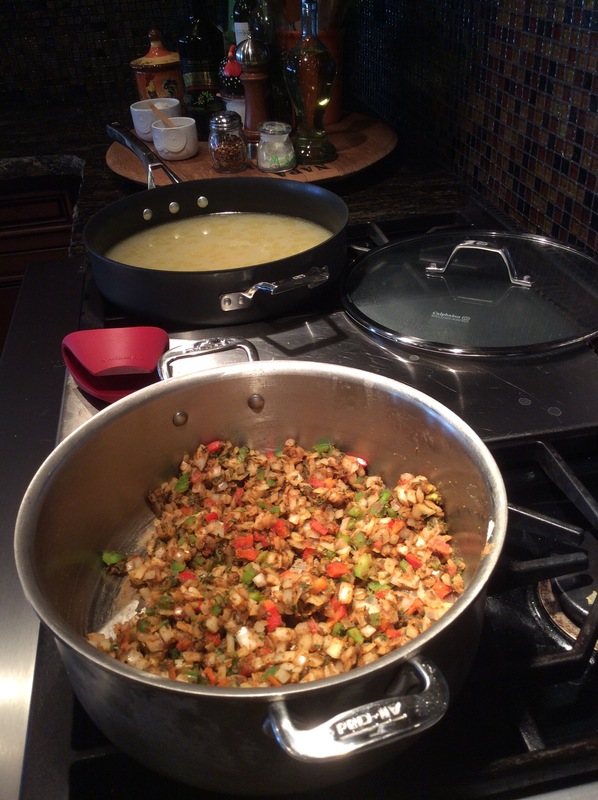 It was Mardi Gras a few weeks ago in New Orleans, so time to cook up some Gumbo. We flew there last week for a construction convention and our mouths have been watering all week thinking about the food we were gonna enjoy. Thought I outta make us up a batch and get us ready. This is a very easy recipe just a little time consuming. A little lighter recipe then some, the secret is to get a really dark chocolate colored roux, a process you learn over time. If you get your roux to dark to fast it will burn and ruin your whole batch. So go slow and watch it like a hawk! First I prepare myself. Get your song station on the right tunes. This is what I use “Songza” and here is a link to the playlist I listened to. Good ol Southern music got me in the mood. Get yourself something cool to drink cause you cant leave once you get started. This is the basic recipe I use, but added my notes of what I did a little different. 2. Heat 2 tablespoons oil in Dutch oven. Add chicken . Sauté until browned on both sides. 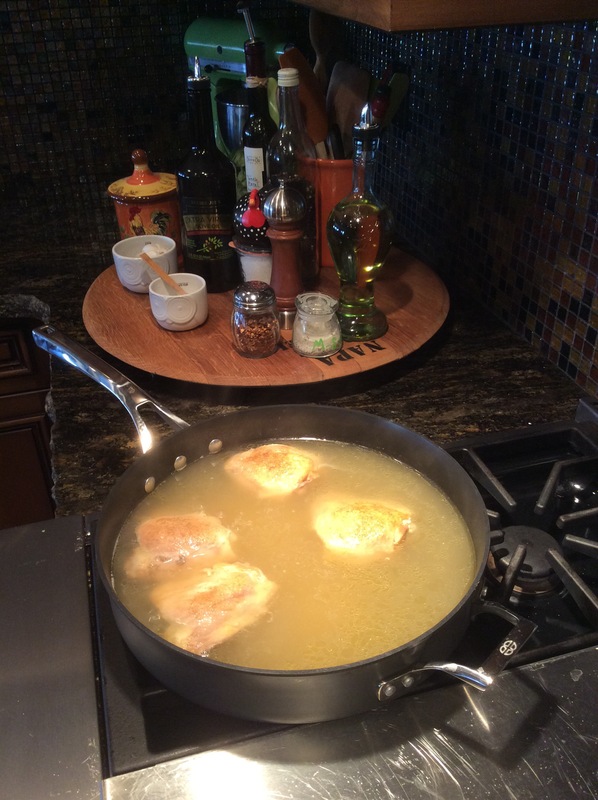 Remove chicken to a large saucepan, reserve drippings in the Dutch oven. add your 8 cups of broth or water ( I prefer broth) over chicken cover and let simmer for 1 hour. Drain,reserving stock, bone chicken and reserve meat. Before you start the next step you gotta do a few things because when you start the roux you CANNOT do anything else for about the next 10 minutes. So use the restroom, tie up the children,let the dog out and turn off the phone. Ok carry on. 4. This is the pan I browned the chicken and sausage in. Add enough oil to drippings to equal about 1/2 cup. Heat and add flour 1/4 cup at a time, stirring until smooth. 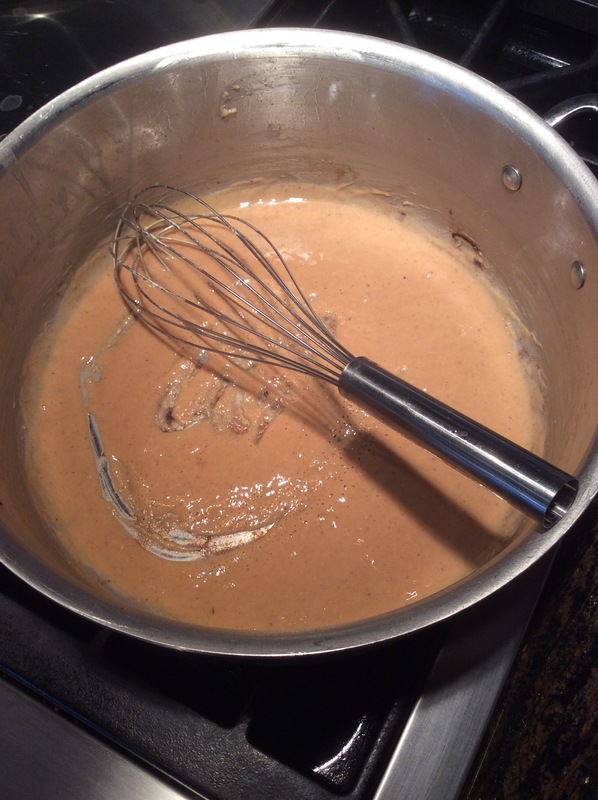 Cook roux, stirring (whisking) constantly until browned and a deep caramel color 5-7 minutes on a medium flame( I think I could of cooked this roux a little longer and darken it up some but I started getting worried and stopped here and it was still very good. Add onions and peppers and celery,parsley and 2 Tablespoons of seasoning mix. This will be a thick clump of veggies but that’s good. 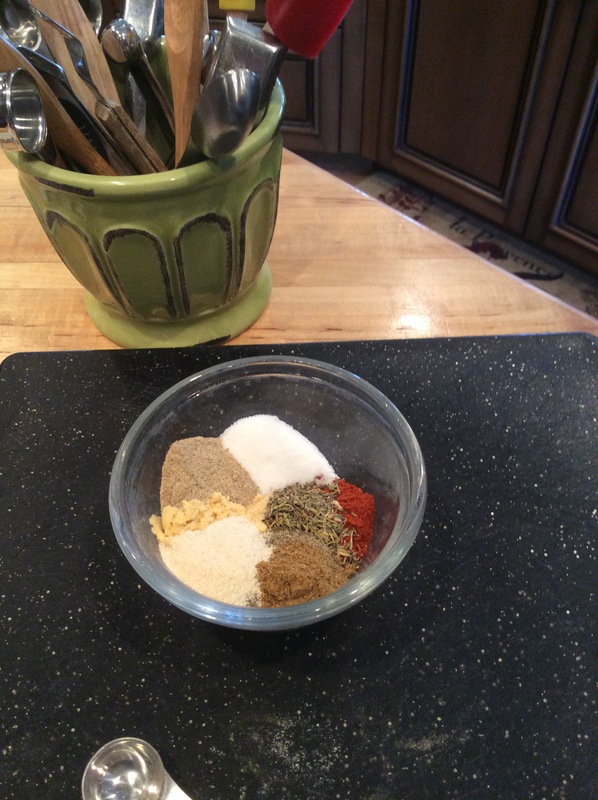 (You will have enough seasoning mix for your next batch of Gumbo). Whisk your clump well and cook 10 minutes. 5. Add reserved stock about 1 cup at a time and whisk well with each addition and cook 20 more minutes. Add chicken, sausage and seafood and cook another 10 minutes. Cook low and slow for another hour or so, make a batch of white rice to ladel the Gumbo over and your set. 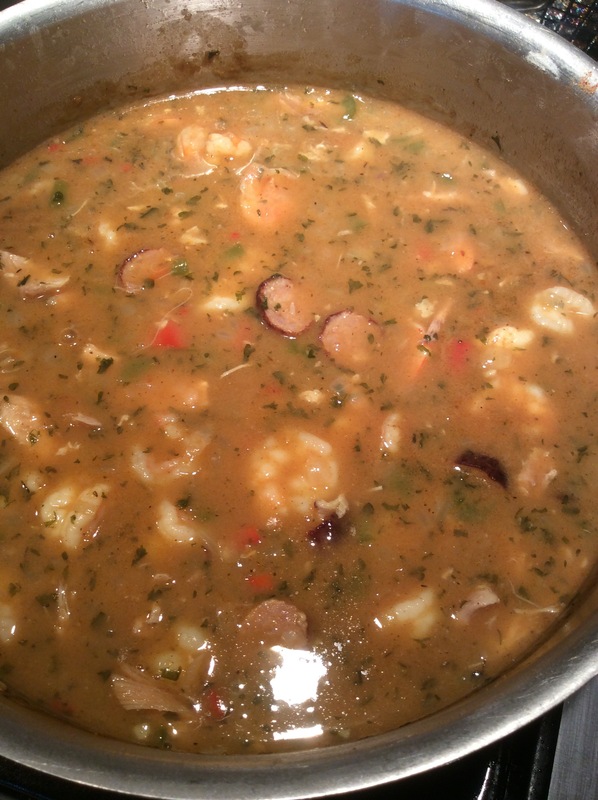 They say Gumbo is personal, so you can add your favorite ingredients from different sausages, okra,oysters, chicken breasts,thighs or legs or all! Spice it up or down what ever your heat level is. Im thinking next time to make up a batch of Hush Puppies to go along side. If its your first time of making Gumbo read up on it on the Internet and get tips and ideas for your first batch. One thing I know is true, if you make up a pot of Gumbo you have friends. Thanks to my Mother-In-Law Shirley Buxton for inspiring me and feeding me this dish. I fell in love with it and what it represents.